Among the many gateways to appreciating jazz, science fiction doesn’t come to mind immediately. Yet the theme has been consistently documented on record, from Ornette Coleman’s aptly titled album Science Fiction to Sun Ra’s cosmic explorations. You name it. 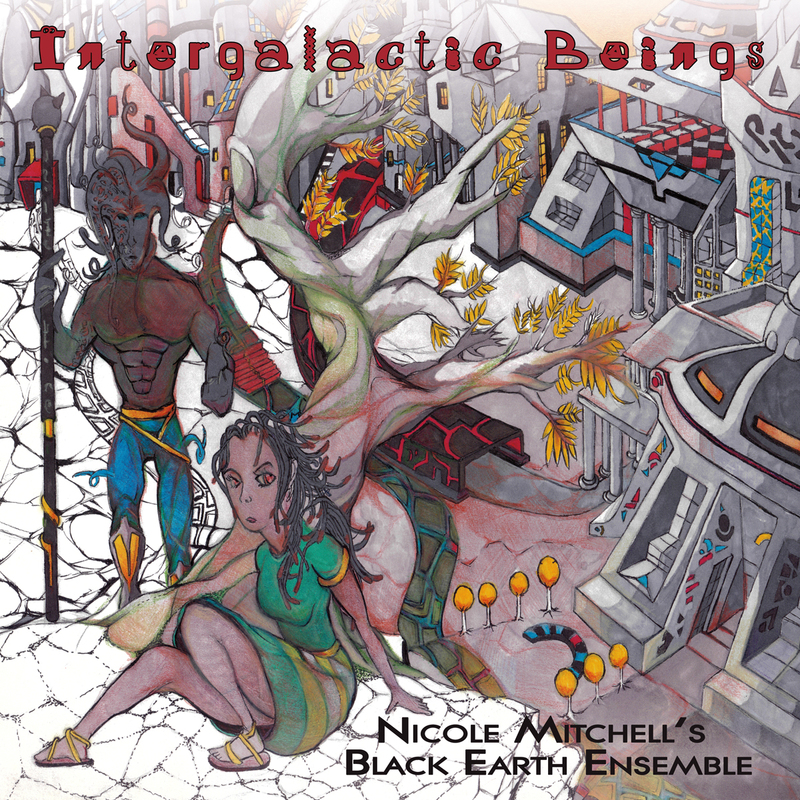 On Intergalactic Beings (FPE Records), composer and avant-flutist Nicole Mitchell continues to explore the work of African- American writer Octavia Butler, here focusing on the perpetuation of humans through interaction with benevolent and life-saving aliens. In this futuristic scenario, humans are recovering from nuclear war and have been abducted by and forced to breed with extraterrestrials to survive as newly regenerated forms. Wait a minute, what’s that got to do with music? Let’s take a listen to find out. Consisting of flute, tenor sax, bass clarinet, trumpet, sralai thom, violin, cello, electric guitar, bass, percussions, drums and vocals, the album offers a richly layered soundscape full of textured dynamics and phantasmagoric storytelling. From the stuttering motion of the opening “Phases of Subduction” to the closing “The Inevitable”, the music unravels its mysteries in a complex spool of interweaving lines fraught with eerie darkness. The track “The Ooli Moves” is a trance-like dance introduced by the unison line of bass and violin that gradually builds into a haunting maelstrom plodding along with burning urgency. After the first motif fades away, a fuzzed-out bell-like guitar interlude brings in the second motif and there’s a sense a transformation has occurred. “Transformation is inevitable” warns vocalist Mankwe Ndosi and the well-chosen titles match the transient quality of the songs, each of which seems to evolve through various shape-shifting phases. On “Dripping matter”, for example, a honking wail of guitar, violin and horns seem to drift in and out of the dripping rain soon pierced by Josh Abram’s cavernous bass tumbling along in the oozing murk. The song segues into “Negotiating Identity”, which has oenomatopeic vocals – the post-mating language? – a serrated freeform sax solo which blends into the initial wail returning to close out the song. In this experimental setting, Mitchell’s flute takes a back seat for much of the album except for a compelling solo on the closer “The Inevitable”. Not taking anything away from the leader’s instrumental chops, her art, at least on this album, has more to do with the organic unity the album achieves in its 9 multi-section songs, balancing improvisation and composition in a rigorously structured and challenging narrative. In the liner notes, Mitchell explains: “by musically illustrating the process of fear, resilience and transformation with Intergalactic Beings I created sonic experiences to confront the listener.” And confronted we are. These songs are full of raw energy, alternating exploratory ensemble playing with alluring thematic statements reflecting the composer’s deep sense of form. “Resisting Entanglement” is a shining example of that. A little daunting in scope at first, the rewards of the album will amply reveal themselves after a few listens and a couple of trips in outer space. Intergalactic Beings is available on the FPE record label. Many thanks to FPE founder Matt Pakulski for hipping me to Nicole Mitchell and the Matana Roberts connection.